The Pittsburgh Post Gazette Weekend Mag Dinning Critic, China Millman, selected 6 Best Brunches establishments. China named Tazza D’Oro one of them! (To read click here) Yes, we are totally excited, but to be mentioned with other innovative, unique and highly respected businesses – Point Brugge, Coca, Oh YEAH, Crepes Parisiennes, and Cafe Richard- we are slobbering all over ourselves. Thanks China. Come on in for brunch and a “fantastic coffee” drink. Brunch hours are every Sunday from 9 am to 1 pm. China so far seems a huge improvement over prior P-G "critics". 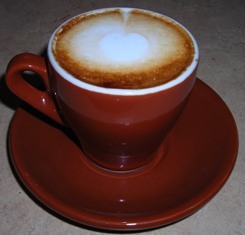 Nice contrast on that capp in the photo. That would score some points in competition... which, btw, is in Feb. in DC if any of your folks are interested... we could use more representing from Pgh! Rich-thanks for the note. I love reading China's reviews. We were really surprised by the write-up and thrilled. Thinking about February too.